Scouting is all about the outdoors. While boys appreciate the fun and fellowship of the regular meetings, outdoor activities play a crucial role in keeping boys interested and active in the Scouting program. Every leader should be sure there are plenty of opportunities for boys and their families to experience the “outing” in “Scouting” by including at least one outdoor activity per month. 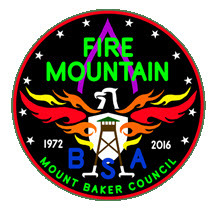 Fire Mountain Scout Camp is the Council’s premiere camp located near Mount Vernon, WA. From a great dining hall to a thrilling zip line, you’ll love it! Register for 2019 Summer Camp Today! Online registration system is coming soon. Click here for the registration form to hold your spot. Cub Scouting offers camping opportunities for Cub Scouts through day camps, Webelos resident camps, Webelos den overnight campouts, council-organized family camps, and pack overnighters. Click here for Cub Scout Camping opportunities in the Mount Baker Council. Scouts BSA provides many opportunities for youth ages 11 through 17 to help plan and participate in rugged outdoor adventures. From day hikes to Camporees and summer camp, the troop plans activities that match the interests and abilities of the Scouts. Summer camp blends fun program with advancement requirements to reinforce skills learned throughout the year. Scouts may attend summer camp and learn teamwork within their patrol and troop. Older Scouts may also choose to participate in high-adventure programs such as rock climbing, rappelling, and whitewater rafting. Youth registered in Venturing are eligible to participate in crew, district, council, and national Venturing activities as well as national high-adventure programs and world jamborees. Venturing’s Kodiak and Kodiak X courses offer a blend of leadership training coupled with High Adventure activities for a truly unique experience. The Sikhs Mox Lamonti lodge of the Order of the Arrow web pages contain information for all Arrowmen. The Boy Scouts of America believes that camping is an essential part of the Scouting experience and wants all Scouts to experience this adventure regardless of economic status. Through generous grants and contributions, the Mount Baker Council is able to offer assistance through the Opportunity Fund so all Scouts have the opportunity to attend camp. Camp Grants are specifically for Mount Baker Council Scouts attending an in-council camp. To learn more and access the application visit our Camp Grant page. In addition to the Council’s camp, and other surrounding outdoor locations, there are Public Land opportunities.